a lone ranger in a terracota pot at our backyard, was almost wrecked but ended remarkably well eventually! 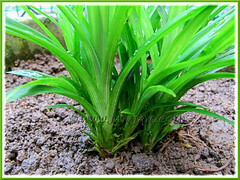 Usually, the edible P. amaryllifolius or Fragrant Pandan suckers freely when grown in the ground with ample space to expand but very rarely in pots due to space constraints as observed and experienced by us over many years. However, a fluke incident showed us that it can be achieved, though somewhat differently. This was what happened when the cat’s away, the mice were at play! The wild monkeys that prowled behind our backyard had a field day during our absence when we were holidaying at Felda Residence Hot Springs, Sungkai in December 2009. And, with our beloved miniature pinscher, Maxi, away too at a boarding home, they targeted our luxuriant Pandan Leaf plant and destroyed its growing tip as pictured on the right. Were they rabid monkeys, we wondered? Should we throw away the damaged plant? Anyway, we opted to trim back on the tall and top-heavy potted plant, leaving behind just a 10-inch tall leafless stem with its aerial and stilt roots. Simply to experiment and see what will happen eventually with just usual watering. Lo and behold, a couple of months later, we were delightfully surprised when a bunch of aerial offshoots emerged unexpectedly at the cut area of the stem. How wonderful …so many plantlets that can be propagated by growing them as new plants! Really a blessing in disguise that also gave us new insights on how to get numerous pups from a single matured plant. Just need to cut off its top to induce its production! Can shorter sections of the leafless stem with just an aerial root or two be planted to get more plants, I wonder? 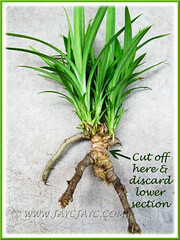 Nonetheless, the tip cutting that has some aerial roots can be replanted to continue its growth. 1. By separating the suckers or offsets that emerge naturally from the soil at the base of the parent plant. To propagate, just detach one offshoot with its roots from the parent plant (either pull it with a slight force or use a garden spade or a sharp knife if necessary). Then, wash off any soil from its roots, trim away some of the basal leaves and replant it as a new plant in moist potting/garden soil with good drainage. Ensure that it is planted with soil level up to the neck. Best to site your plant in a semi-shaded spot and with regular watering, it should flourish with least care. 2. 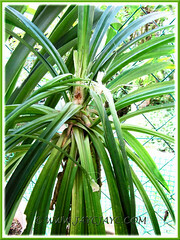 By removing aerial offshoots or plantlets that emerged atop the cut end of a pandan stem as seen in the above second image. 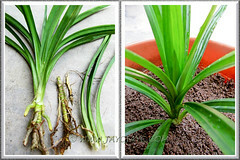 To get a matured Pandan Leaf plant to produce these offshoots, just cut its tip with a sharp knife. A cluster of plantlets will develop subsequently and once they form their own roots, you can cut them off from the parent plant and plant them individually as new plants in well-drained soil. We propagated our cluster of aerial offshoots somewhat differently though. Knowing that it’s a little more difficult to propagate pandan plantlets with somewhat hardened aerial roots, we didn’t want to wait too long for that to develop. Once we observed that there were signs of tiny new root growth on the plantlets, we decided to prune off the whole cluster and remove the lower section of old stem and hardened aerial roots. 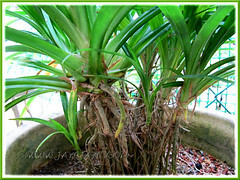 Then, we planted them altogether in a single pot filled with garden soil (hehe…knowing pandan is not fussy, we conveniently used some recycled soil) to allow them to easily grow and develop their own roots. See illustrations below. 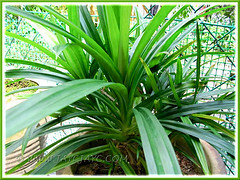 As seen in the photos below, the plantlets grew and matured very well over a period of a year. Hardy and fuss-free, they just require regular watering in our tropical heat, some sunshine and occasional feeding. Eventually, new suckers were added and number increased to 14 plants. Looking closely at our potted plants recently, we realized that it was definitely time to propagate them as individual plants. Gosh, we had procrastinated in our garden chores far too long! To propagate, as illustrated below, separate each sucker with its roots, snip off some older roots and basal leaves. Then pot it up to its neck in well-drained moist medium. It’s sure to grow with normal care – water regularly and provide sufficient sunlight. An occasional feed a month later will make it happy too. provide sufficient ground space for the mature plant to produce numerous suckers for propagation. separate the offsets only when they have their own roots for optimum growth. you may need to soak the plantlet (especially if it has only 1-2 aerial roots that are rather thick), in clean water for a week or two to encourage more secondary root growth before potting in soil. Soak only the root section, not the leaves. in temperate or non-hardy regions: propagate during the warmer months, preferably in pots so that it can be overwintered indoors during winter and protected from frost. During winter too, water sparingly on the soil, not on the crown of plant to prevent trapped water that will lead to rot and its eventual demise. Learn more about winter care, where to buy them, etc. from this 3-year old Daleys Fruit Tree forum thread on Pandan amaryllifolius that’s to-date still active. When grown on the ground, the roots look like stilts. I like to imagine that they have legs, haha. I always wonder why they never ever produce any flowers. Our potted plants usually display such roots too…I find them somewhat unsightly. Should let my imagination fly like yours instead, huh! I got my pandan plant in the states. I separated the 2 plants after I got them in the mail. One of them started drying up. I wasn’t sure what to do. It’s so hard to keep them alive. I’ve tried just leaving it in the soil and water it sparingly. It’s still drying up. So now, I decided to put the roots (including the aerial roots) in water. I really don’t want my plant to die. It’s so expensive to get them here. Can you advise? Hi Ankeny! There’s an interesting forum on the Pandan Plant @ http://www.daleysfruit.com.au/forum/pandanus-amaryllifolius/ where you may want to enquire further from the other growers whose climatic conditions may be somewhat similar to yours in the States. Here in Malaysia, it just grows easily on soil without much fuss in our tropical humid heat and rain. Hello…..I live in San JOse, CA, and have been looking desrperately for a nursery that can help me obtain a root, nut to no like. I did find an oriental store that will sell 3 fresh leaves for $0.99. I have been trying to find one with a root, but to no avail.What are my chances of trying it by using very bottom, that looks mature , soak in water, til it roots! (Boy do I wish!) What is your experience in this situation…Any help will do,…. Sorry, Tess…we’ve never experimented rooting leaves. I have been looking for more than a year either online or visiting some nurseries. I am based in the UK. Acquired 2 aerial pups recently. Have soaked the roots in water for the last 3-4 days. However, the root tips are starting to look a bit brown and I am worried that they may be rotting. I have had a look at the forum and submitted a post (pending publication). Did you have a similar experience with your aerial pups? Should I just pot them up in some well draining soil? Hi Sue… you need not soak the aerial pups that have some sign of roots. Just pot them up. Hence, why not just try potting them and hope they will grow eventually. Hi Jacqueline, I like your post and pics of the propagation method. I’m from Perth Western Australia and have been growing them for awhile now in our somewhat temperate climate. We’re not able to plant in ground as our winter climate here will rot them away. So the’re basically pot-bound. We’re about half way through our Summer here and I have alot propagated in water at the moment. I have had alot more success and quicker strikes by have them all in and under plastic to increase the humidity as well. Masses of roots form quite quickly and will be hardened off and replanted in soil before the onset of Winter. Another observation I found with existing potted Pandans is that you can sometimes initiate offsets or pups by simply scoring the baseline of the plant. Oooh Rahaidi… thanks for your thumbs-up. We appreciate your generosity in taking the trouble to share your propagation experiences and successes for the benefit of those seeking help in this matter. God bless you. Your method of scoring the baseline to get more pups is new to me… I just went out to try this out but unable to proceed further as there are numerous aerial roots that have submerged into the soil around its trunk. I suppose this is only feasible on younger plants where the stem is visible, right? I got 5 cuttings in the pot and I cover it with plastic bag over out side in the indirect light and bring it in the house at night. I am in modesto ca. The weather is still too cold for them to be outside at night. Yesterday I checked and two died I think I water too much. I hope the other three will survive. All the very best …may the 3 cuttings grow luxuriantly to provide your needs. They are not looking too good. I think I will remove the cover to avoid the roots from rotting. I know that this article is two years old but does anynone can share/sell pandan plant? You’re most welcome, Dave. The pleasure is all ours in sharing. All the best in propagating new plants. 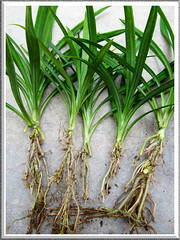 Thanks for your post on propagating pandan. 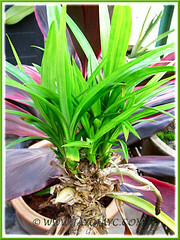 I live in Brisbane and been trying to grow get offsprings of pandan plant for a long time. A few months ago, I notice there are a few pups that are growing at the base of the stem. I prune one pup and potted it but it died. Then I waited for a couple to grow bigger and pruned them too. One plantlet had a harden root( similar to your illustrated photo) If I were to cut that high up of the roots as illustrated, will it be able to survive without much of its roots? The second pup had only a stem( no roots at all) that was pruned off the mother plant stem. Do you think if I use root hormone , it will help stimulate roots to grow? Or should I leave it in clean water to grow the roots as per your first directions in your post? Thank you in advance and appreciate everyone’s advices! You’re most welcome…. we love sharing our experiences. Firstly, to propagate any of its plantlet, it has to be separated intact with at least a couple of roots to ensure success. One way to induce the roots to emerge is to remove a few basal leaves and roots will sprout from the leaf nodes. Your question re the second pup, I’d advice you to remove a couple of its basal leaves before soaking its stem in water to encourage root growth. I’ve never tried root hormone before. Hope these are helpful and wish you all the best. Hi there, my pandan plant just toppled over. And came off while the bottom is still intact. The roots all seems fine. But the bottom of the pandan plant is soft and black. Is it due to us watering our plant from the top? How many times a week should i water my plant. I live in singapore. I think watering on the your plant’s crown is causing it to die from root rot. Watering is dependent on your climate… daily watering on very hot days and less times during the rainy season. If the top section of your plant is healthy and has a couple of aerial roots, you can replant it. My pandanus has three new shoots coming out in between the lower leaves (not from the base.) I just wonder are they new baby plants? Can I cut them to start a new plant? Currently, they have noroots just a few young leaves. I have this plant since 2013 April and I grow it indoor. Please advise.. Thank you very much. I’ve noticed before that new shoots will eventually emerge between the lower leaves when the basal leaves were harvested for cooking. I would advise that you allow some aerial roots to grow on them before cutting off to propagate them as new plants. I just came across your forum. I hope it is still up and running. I live in the City of Toronto, Canada and the weather up here is not always great. I have a Pandanus Veitchii plant that I received from someone here in Toronto. It is a slow grower. People have been saying that the plant should be put outside in the summer here. I placed it on my veranda behind another plant because the sun is really hot here and I do not want to scorch the leaves. The front veranda’s sun comes in the late afternoon so it gives off light and shade. Do you think that putting it behind another plant will help protect it from the sun? Also what type of fertilizer would you use on this plant? Sorry, I’m unable to help you because Pandanus veitchii is a different plant from that of Pandanus amarylifolius or Fragrant Pandan Leaf. I’d advise that you google search for your plant. All the best to you. I brought 2 Pandan Amarylifolius plants all the way from my Mom’s garden in the Philippines to Riyadh, Kingdom of Saudi Arabia. Both of them have well established roots and about 5 inches long. I put them in a pot made from empty bottle of soda. I placed them by my office window so they would get morning sunlight. They were very healthy in the first 2 weeks. Then all the leaves started to get dry last week. Is there any chance that these plants will survive with only the stem and roots? I’ve been reading bunch of articles whether this is possible. Like how many weeks or months before I can see new leaves to sprout? Hope to hear from you soon. Thank you in advance! in my humble opinion, I’m confident that as long as there are healthy roots on the stem, it’s sure to survive. All the very best in your endeavour. I have one growing in my garage since 2013. I cannot grow it outside because the cold Canada Winter will kill it. It does not have suckers at the base but it does have some new shoots growing in between the leaves. I just cut two off the plant and currently they are soaked in water. I just wonder would there be any new suckers coming from where I cut them? How long does it take for the secondary roots to grow? Currently, the two cuttings only have aerial roots. Hope to hear from you soon. Thank you in advance. Yes, there will be new suckers from where you cut them. Please look closely at all the pictures and you’ll be able to figure out their growing status. May i ask how do you cut the thick root off? You can use a pruning shear. Thanks for the guide! I have a couple of questions though. I had received some root, with no leaves, from a friend and I am hoping to get them to root. The plan is to soak them in water. How do I tell which portion is supposed to be above water, which part below water? How do I tell apart aerial roots from ground roots? Just leave the root portion below the water. Aerial roots are those above the ground. Thanks for the reply Jacqueline. I received the roots completely cleaned of dirt and wrapped in paper damp paper towels. A friend snuck them back from Singapore to Toronto. So I have no idea what goes where…. Could you give a little more description? How do I identify what should be above ground? Keep the root portion in the water to encourage more secondary root growth before potting in the soil. Since there aren’t any leaves yet, allow the rest of the top portion to be above the ground. Help! The upper portion of the root stock is starting to rot. I had already transplanted it to soil last week. Can it be saved? What do I do??! It appears that you just have to wait and see. Hope all turns out well for you. I am staying in Perth and had 2 pandan grown in greenhouse. So far it’s good and had harvest the leaves. I got some shoots and suckers but unsure how do I propagate from these offshoot. Got some pictures but unable to attach here. Is there any way that I can show the pictures and you help me by pointing where to cut. Thanks.